Although since recently a king, I felt like a clumsy courtier. Illustration for A Breeze of Spring. Again this is so lovely, and again I find myself feeling only warmth from the image due to the perfect choice of tones and the memory of the accompanying story! 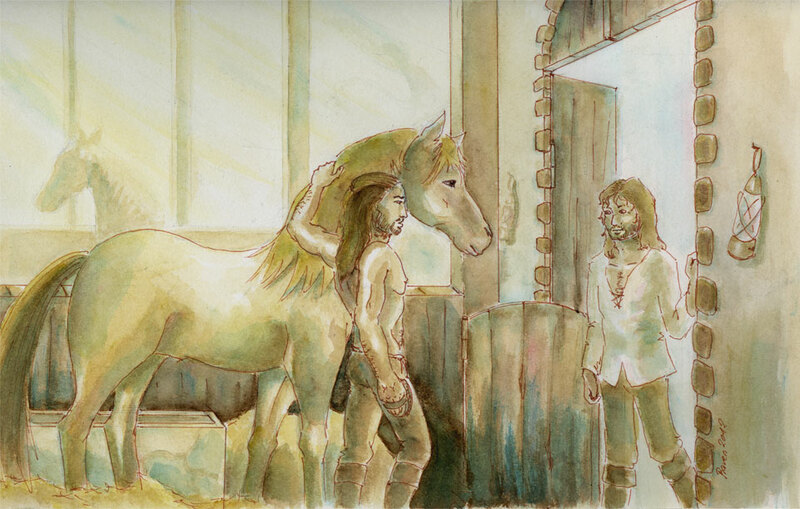 Faramir’s smile is melting my heart a little, you know, as much as the story involves Eomer selecting a horse for Faramir, I think it is very much the latter who is driving the encounter in a direction he wishes it to go (luckily the same one that Eomer wants, too.) That little smile there, his gentle humour even when speaking of sad things, is somehow all encompassed in a few strokes of your pencil and I am eternally envious of that skill! What is there to say in the face of such lovely praise? I feel how little I deserve it and yet I could bath in its glory for hours… ah, the mind of men is easily corrupted..!